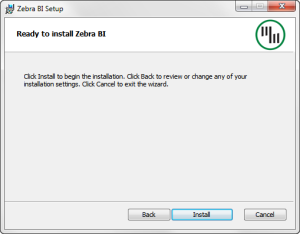 Hi, it appears you already have the latest version of Zebra BI! No need to update. 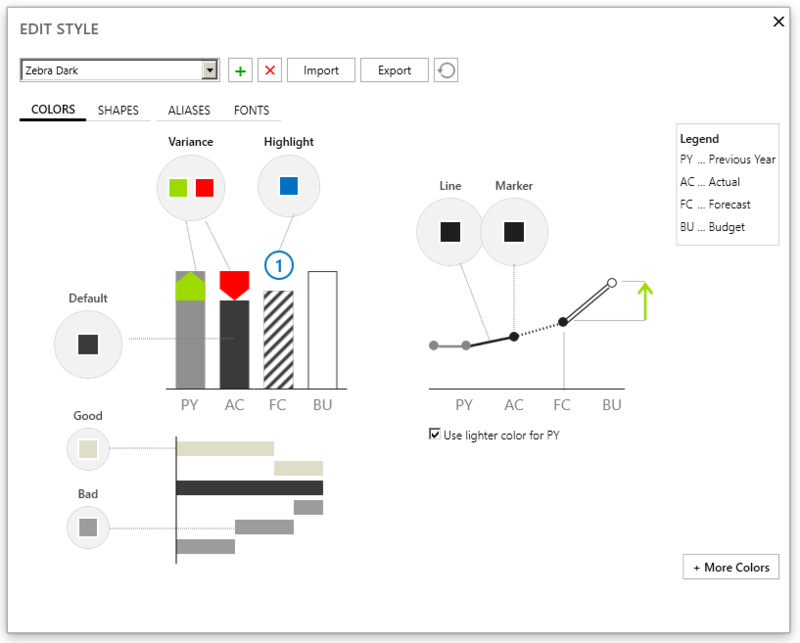 To update your Zebra BI Dynamic Viewer click here. You can now create segmented waterfall charts. Simply insert another column of data (for FC or BU, for example) and insert the chart as before. "Move" functionality is now available for small multiple reports. Simply click the icon and move the small multiples exactly as you move single charts. 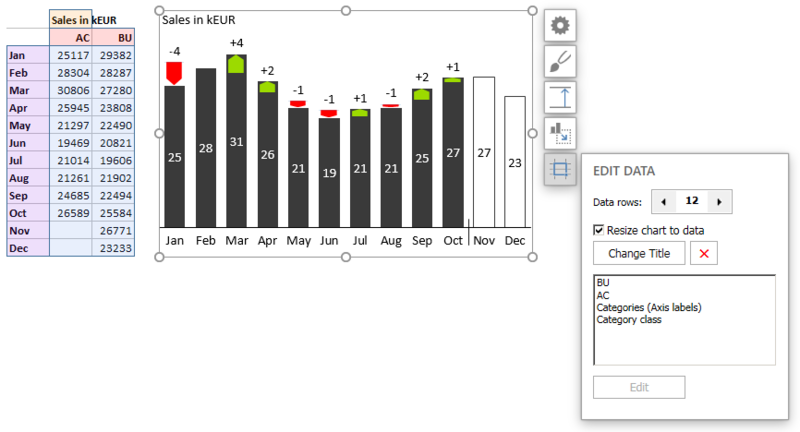 Now you can insert two difference highlights in charts. Click on the green "+" button to insert the second difference highlight. The number of labels on limited outliers has been increased from 3 to 5. Default to relative variance for lollipops. Support the option of using three scenarios without actual. Add the option for disabling italic on relative labels. Add an option to use variance colors for dot markers. Prevent Excel crashing during tutorial in certain cases. Fix a problem with moving a chart when it is in a group. Fix a problem with migrating hidden sheets. Fix a problem with label density calculation when we have missing values. Fix a problem with sorting contribution charts. Solves an issue with the icon for French language. Fixed a bug when scaling certain Waterfall charts. Insert charts from multiple ranges. To insert Zebra BI charts from multiple ranges, just select all desired ranges by holding Ctrl key between selections and then insert a chart normally. The Data Editor. 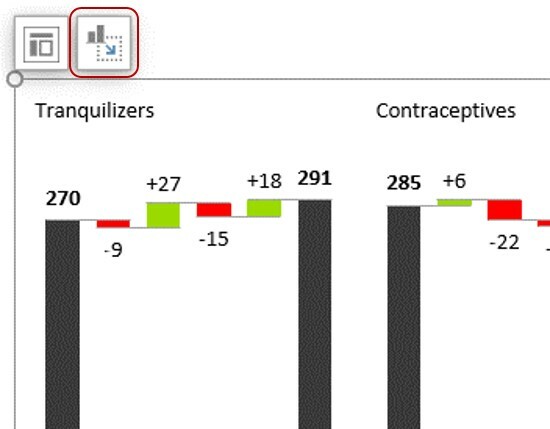 This new button on Zebra BI charts allows you to change the source data of inserted charts. You can grow or shrink the chart or completely change the chart data to a different series. Completely revamped Style Editor! Now it's easier than ever to create and manage your design styles. The leading motivation behind the redesign of Style Editor was to make it more intuitive to use. Click "Edit" in Zebra BI ribbon to access the new Style Editor. Improved line charts. 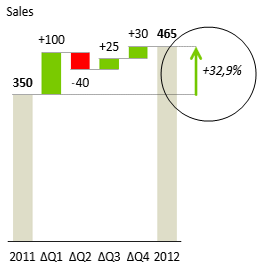 Now you can design two types of markers in line charts separately: inner and end markers. Dynamic difference highlights. Now you can insert difference highlights to "dynamic" categories: First, Last, Next to last, Min, Max. You can also compare different scenarios on the charts that support multiple scenarios. Improved parsing of chart data. Zebra BI is now much better at recognizing what the data represents. Added support for date categories. Added support for Chinese language. Fixed a problem with Variance Area charts when the first values were missing or #NA. Fixed a problem with adding comments when multiple cells were selected. Fixed a problem with chart settings icons disappearing after applying Styles to the whole Workbook or Worksheet. Improved compatibility of Zebra BI with other Excel add-ins (especially built-in ones like Solver and Analysis Toolpak). You can now break axis on waterfall charts! This is a slightly controversial, but highly useful feature. 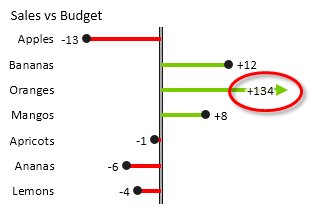 With this feature, having too small changes compared to the totals won't be a problem any more (on a waterfall chart). Now can use waterfall charts on any data - no matter how small the changes are. Speed! Some of the functionalities of Zebra BI are now much faster. You will notice this especially on worksheets with a lot of scaled charts (for example, small multiples). A new "Apply" button in Reporting Standards section of Zebra BI ribbon. Use this button to apply the selected style to all charts on the current worksheet or the entire workbook. Cześć! Zebra BI now speaks Polish. Fixed a problem with percentage absolute scale format. You can now add difference highlights to Zebra Charts! This allows you to quickly compare two categories. The difference can be shown as relative, absolute or both and you can choose between multiple arrow Styles. Read all about this here. Highlighting single values in charts is now much easier. Just hover over the column/bar and click the blue "+" button that appears. Find out more here. 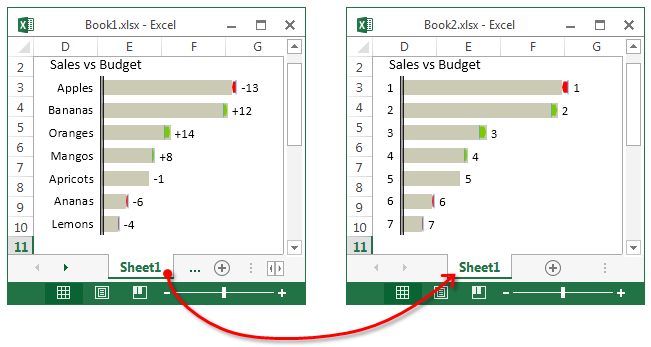 Exporting as (static) Excel Workbook now supports two options: export with static charts and snapshot. Read more here. Improved color picker on the Edit Style form. Fixed a problem that could cause Excel to crash in the Getting started tutorial. Fixed a problem with Workbooks that contain Chart Worksheets, which could prevent the users to add new Charts to the Workbook. You can now export your files to static Excel files. Your friends that do not have Zebra BI (yet :)) can also view them. Improved export to PDF files. You can now choose the range of pages to export. Improved the position of labels on Contribution charts. 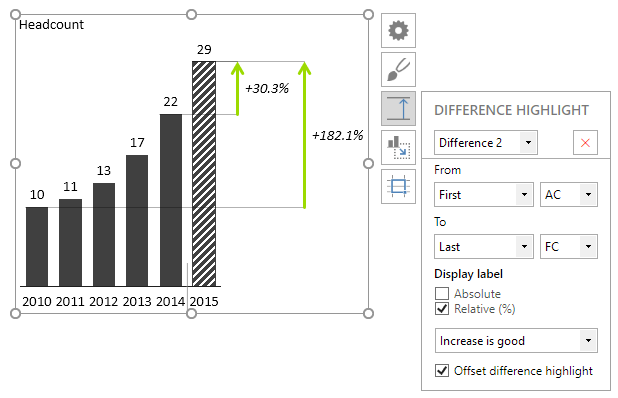 Improved the position of chart settings forms in Excel 2016. Improved the Getting Started Tutorial. 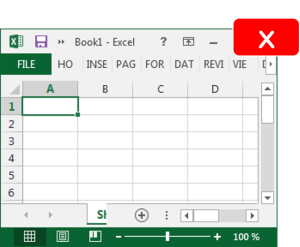 Fixed an issue with Excel 2016, 64 bit crashing when closing the application. Fixed an issue that could cause Excel to crash when clicking on a chart when using Freeze panes. It is now much easier to send us Zebra BI diagnostic information. You can find it in the About window. Improved export to PDF files. You can now choose between multiple options when exporting, also added support for exporting groups. Improved Style renaming and adding new aliases to Styles. Hundreds or even thousands of users can then access their dashboards with a standard web browser.